Homework Hotline is back! The live call-in show, where kids get help with homework problems on the air and online, kicks off its new season on Monday, September 12, 2016 on WMHT. Airing Monday-Thursday at a brand new time – LIVE at 4:30pm, the program also streams online at homeworkhotline.org. Homework Hotline provides the tools students need to succeed in school, and supports academic achievement across a variety of NYS Learning Standards. Teachers from Rochester Dial-A-Teacher take the calls and send them to WXXI studios, where host teachers, who are experts in subjects across the curriculum, are standing by ready to help kids work through their homework assignments live on television. In addition to live homework help, Homework Hotline video segments explore careers, animals, New York State History and the arts. Special guests show up for live performance and students win prizes with Math Mazes and Science Challenges. The premiere episode, on September 12, will feature a special video segment produced by Fish & Crown Creative, a video production company based in Rochester, NY. The segment spotlights projectionist Bri Merkel and her work at Rochester’s Little Theatre. Six master teachers host the series. They include: Donna Mineo, 7th and 8th grade math teacher; Joe Zuniga, Science Coach; Craig Zaremba, middle school science and Living Environment teacher; Laura Drake, 7th grade math teacher; Ed Hathaway, 6-12th grade math teacher, and Samuel Simpson, a city school math teacher. When students and families go digital with Homework Hotline at homeworkhotline.org, they find video segments that are searchable by subject, plus there is access to interactive games, Homework Hotline polls, homework help tips and a list of educational links. 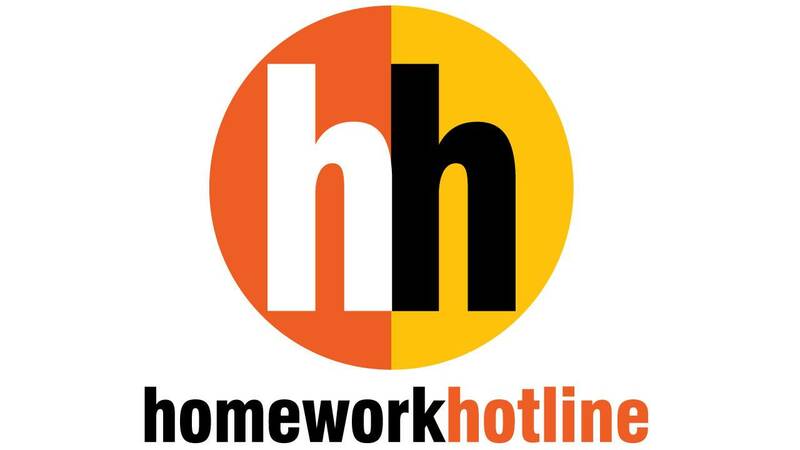 Homework Hotline is also on Twitter, Facebook, and Instagram, where it shares homework tips, behind-the-scenes work on the show, and entertaining educational facts. Homework Hotline is funded in part by the New York State United Teachers (NYSUT) and produced by WXXI, in Rochester, NY in association with the Rochester Teachers Association and Dial-A-Teacher. Homework Hotline has received numerous New York State Broadcasters Association Awards for best program or series designed for children, plus a 2010 My Source Education Innovation Award from the Corporation for Public Broadcasting, Silver Telly, Bronze Telly, and an Aurora Award.